Colette Young will custom tailor a motivational message around the role of the executive spouse to meet the goals of your meeting. The subject can be addressed to spouses of executives, executives themselves or a mixed group of both. 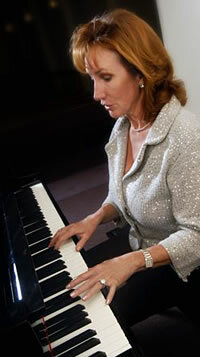 Quite uniquely, Ms. Young can incorporate her extensive musical talent into the presentation for added audience engagement and a most memorable experience. Ms. Young will be happy to meet with you to learn more about your meeting objectives and offer idea options on how to incorporate her speaking talents to help you make your next meeting a success. These are just a few of the topics that Colette Young can tailor to meet the needs of your audience and goals of your meeting. She can also tackle most any other corporate issue you may like to see addressed as it pertains to the lives of executive men and women.